The MAX40YL is a short shackle motorcycle disc cable U-lock. TRIMAX cable U-locks are simply the strongest short shackle locks you can buy. 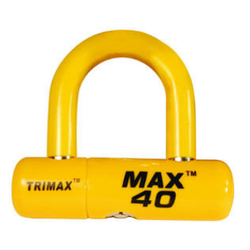 The MAX40YL is ideal when combined with a TRIMAX cable or chain for securing motorcycles, bicycles, spare tires, ATVs, marine, trailers and much, much more. Type B key, which is an ultra secure wise wafer key. Lock core design provides the highest degree of protection against picking. Includes 2 keys.